When a new president is elected in November, someone will be called to greatness. But it remains to be seen whether that call will be answered. In the wake of the Clinton scandal, the upcoming election presents an opportunity for candidates and citizens alike to reaffirm their belief that the office of the president demands greatness. But Marc Landy and Sidney Milkis suspect that the public will be disappointed once again, because the demand for greatness far exceeds the supply. In fact, they claim that we have had no great presidents in the last half of this century. In this provocative new book, they explain why. 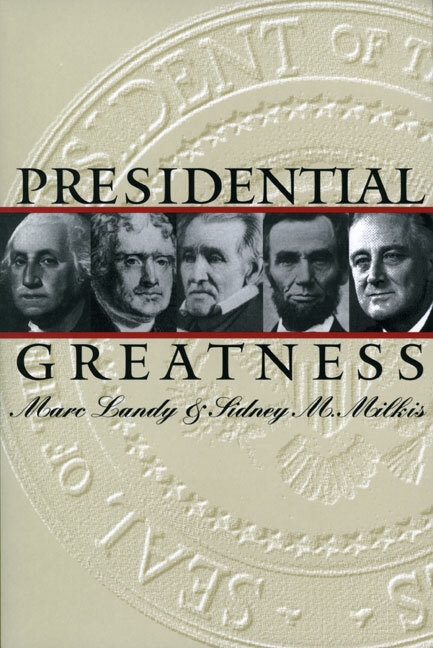 Landy and Milkis look to the past to show how five presidents—Washington, Jefferson, Jackson, Lincoln, and Franklin Roosevelt—set the standards for presidential leadership and achievement. These were men who left genuine legacies, whose vision expanded the office of the presidency as they inaugurated momentous and far-reaching change. They were leaders who knew how to reconcile innovation with constitutional tradition and were able to both educate the people about their agendas and win their allegiance. They were also great builders and leaders of their parties amid times of political realignment. Searching for common threads in these five presidencies, Landy and Milkis enable us to better understand both the possibilities and the limitations of the office. They show how presidents after FDR have never risen to true greatness-not even Lyndon Johnson, an "overreacher" whose Great Society was a failed revolution, or Ronald Reagan, an underachiever whose conservative revolution never fully got under way. Our greatest presidents, they argue, sought to profoundly change the nature of the regimes they inherited and had the luck to assume office under conditions that allowed such renovation; today's leaders have lacked either the ambition, the opportunity, or both. Perhaps, the authors observe, the older our country gets the harder greatness is to come by. Our next great president might be sworn in next year, but he or she will face a daunting task in matching the stature of past leaders. Landy and Milkis's book is an evenhanded assessment of our national icons that reestablishes our understanding of presidential greatness and demonstrates the importance—and reality—of inspired democratic leadership. Marc Landy, professor of political science at Boston College, is the author of The Politics of Environmental Reform and coeditor of The New Politics of Public Policy. ##Sidney M. Milkis is professor of government and senior scholar at the Miller Center of Public Affairs, University of Virginia. He is the author of The President and the Parties and Political Parties and Constitutional Government.